Today's parliamentary order paper shows the government will be giving Te Urewera-Tūhoe Bill its first reading this morning - that's scheduled for two hours. Then there are two Bills together (Ngāti Hauā Claims Settlement Bill and the Ngāti Koroki Kahukura Claims Settlement Bill) - another two hours. And if they have time they are on to the second reading of the Mokomoko (Restoration of Character, Mana, and Reputation) Bill - which I have had something to do with (and posted here). The Tuhoe Bill is a settlement more of smoke and mirrors than of substance from what I can work out. The Crown, having taken so much off the tribe, is very reluctant to give any of it back - and they aren't really giving any of it back. The Crown is quasi/semi giving some elements of management of the Urewera conservation area (a National Park since the 1950s) back to a body that Tuhoe will - eventually - control. That's not actually that much on paper, although because of the isolation it will mean a lot more in practice. But it isn't that much - and the boundary disputes with other Iwi caused by this settlement deal have upset relations somewhat with neighbours. It's a better deal than many Iwi have got - mainly because of the geographical and historical circumstances - but like all deals it isn't nearly enough. Tuhoe literally have all the high ground so this statute is a concession. The best thing would be a restoration of the original 1896 Urewera Act that the conservative government of the 1920s abolished (amid the reaction to the Irish republican rebellion and wanting to settle returned servicemen cheaply onto land suitable for farming). Just five years before that the same Massey government ordered in a police column to march on the Tuhoe village set up by Rua Kenana to arrest him on frivolous charges - the NZ Police shot two villagers dead, including Rua's son. 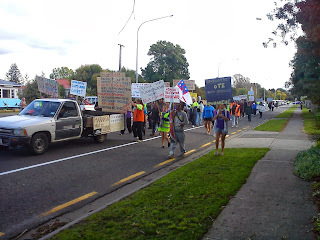 Just seven years ago the NZ Police - fully armed - marched on and occupied Ruatoki village in an operation to suppress a non-existent plot of rebellion. So little has changed. No element of that 1896 Act exists in the Bill as far as I can see. There is no provisions for self-government, there is no provision to get the district and regional councils out. All the mechanisms of confiscation and interference in tribal life will continue under the Act. I do not see any relief from these impositions in the Bill. The make up of the trust to which the government is going to give the compensation is heavily corporate and not at all what one would expect from the populous and sectioned composition of the Hapu of that Iwi. It is very top-heavy and power is concentrated above the flaxroots under their scheme. They are already building their capital at Taneatua before the Bill is through the House. From what I can work out this is all Tamati Kruger rather than a team effort. He is front and centre. 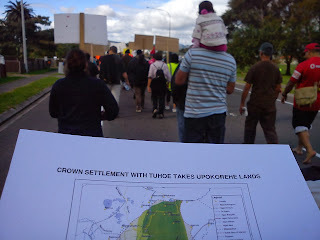 There have been groups within Tuhoe opposed to this plan and they have protested all around the rohe, but without much visibility or media attention. This will go to select committee who will almost certainly want to hold meetings there at which point it becomes interesting.